This summer has been pretty fun so far, even though half the time it feels like I haven't done anything except go to my internship and hang out at home. This weekend I didn't have any plans and then spontaneously did a lot of different things that turned out to be so much fun! My weekends start on Thursdays at 3, so I love squeezing in a lot of things throughout my long weekend. Between dinner with friends on Thursday and Friday, and brunch on Sunday I am definitely ready to get back on track this week. Thursday night a few of my girlfriends and I decided to try a new restaurant on the Milwaukee River. It ended up being delicious and a really fun night! I love going out to dinner with my friends because it's so easy but feels like you're actually doing something, which rarely happens during the week when we're all working. Fridays are random for me because I don't work and my weekend has officially begun, but usually I don't have much to do. I had a pretty lowkey Friday during the day, and then later in the afternoon I went to meet up with one of my closest friends who spent this past month studying in London! I actually saw her while I was there, but that was back in March! We went on a long walk and then grabbed dinner. On Saturday I went to the pool with one of my oldest friends all the way from fourth grade. For once I didn't get too sunburned, but definitely still did a little bit. The weather was so nice and it was really fun to actually jump in the pool and swim around. On Sunday my roommates and I originally had plans to go to one of their pool's for the day and have lunch, swim, and hang out. That morning we saw that the weather wasn't even going to hit 70 degrees, so we decided to come up with a new plan and ended up heading down to Chicago. We were all pretty impressed that we could pull off a plan like that so quickly, and our day ended up being so much fun. 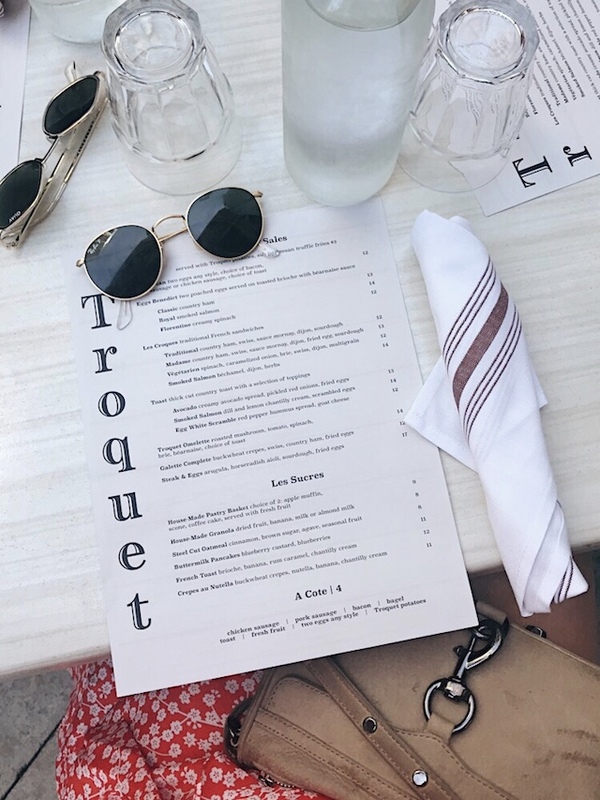 We started the day with coffees and a great playlist for our drive down, and went for bottomless brunch at Troquet as soon as we arrived. Three of us had the Florentine Benedict with truffle fries and it was delicious. After brunch we spent most of the day shopping. Bloomingdales was having an amazing sale, so I picked up these shoes, these jeans, and this t-shirt. We went to a few other stores afterward, and I did a little bit more damage before cutting myself off. I got a lot of questions about my outfit on Sunday, and I wore this dress and these earrings (only $16!) with these sneaks and this bag. I ordered this dress on a whim and planned to return it, but my friends told me I had to wear it and I ended up loving my outfit that day. It was a little revealing in the front and did keep blowing up with the wind, but otherwise it was great and I loved how it looked. This was my first time ordering from Princess Polly, and for reference I got this dress in a AUS 10, which like is a US medium. I'd say it runs very true to size, as I am a medium in most dresses! This weekend turned out to be so fun and I'm so happy I got to spend it with so many of my friends! I love that dress! It's so funny that some of the things we regret buying we end up actually loving. So glad you had a great week!